Fabian Coulthard (born 28 July 1982) is a British born New Zealand professional race car driver, currently competing in the Virgin Australia Supercars Championship, driving the No. 12 Ford Mustang GT for DJR Team Penske. Fabian is a second cousin of former Formula One driver David Coulthard. Coulthard was born in Burnley, England but raised in Auckland, New Zealand. He started his career in karts before moving into Formula Ford. He competed in the Formula Ford support races at the 2002 Australian Grand Prix, winning the Alan Jones Trophy with two wins and a second place in the three races. Coulthard also won the 2001/2002 New Zealand Formula Ford Championship. In the United Kingdom, Coulthard competed in British Formula Renault, where he was teammates with future Formula One world champion Lewis Hamilton. With his budget exhausted, Coulthard returned to Australia to race in the Australian Carrera Cup Championship, finishing third and best rookie in 2004 and winning the title in 2005. In 2006 Coulthard signed to drive with Paul Morris Motorsport, he shared a car with Alan Gurr and Steve Ellery. Coulthard returned to drive the older model VZ Commodore for the same team in 2007, before stepping out after Bathurst to concentrate on his 2008 plans. Coulthard enjoyed a breakout season in 2008 driving for Thief Racing. Driving a Ford BF Falcon, Coulthard finished in the top ten on six separate occasions, including fifth place on home soil in Hamilton, New Zealand and finishing the season in a respectable 13th in the championship. In 2009 he returned with PCR, driving a brand new Ford FG Falcon having another consistent year behind the wheel of the Falcon. At Symmons Plains Raceway Coulthard broke through for his first podium result in V8 Supercars, finishing third at the 2009 Falken Tasmania Challenge and finished the season in another consistent 16th in the championship. In 2010 he joined Walkinshaw Racing, the same operation as the famous Holden Racing Team. On the first lap of the 2010 Supercheap Auto Bathurst 1000, his left-rear tyre blew after earlier contact, spun at 280 km/h through The Chase and rolled six times in the sand-trap before coming to a stop. Coulthard has failed to replicate his 2008/2009 speed with only three respectable results being a seventh in race 5 of the championship, at the 2010 Clipsal 500 an eighth at 2010 Falken Tasmania Challenge and another 5th at the Sydney Telstra 500. In 2011, Coulthard continued racing with Walkinshaw Racing, driving the No. 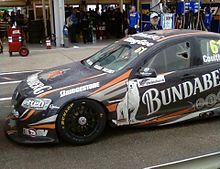 61 Bundaberg Racing Team VE Commodore. In 2012, he left Walkinshaw Racing and moved to Brad Jones Racing. Coulthard won his first V8 Supercars race at the Symmons Plains event in 2013, he went on to win a further 2 races and scored 9 podium finishes that year. He finished the year in 6th Place. 2014 was not quite as successful for Coulthard, with only one race win and five podiums on the way to 8th in the Championship. In 2015, coulthard opened the year strong, with a podium in the first race at the Clipsal 500 and a win in the second. He went on to score another 7 Podiums in the year, placing 7th in the championship. ^ Weeks, James (16 November 2011). "Coulthard switches to BJR for 2012 V8 campaign". motorstv.com. Motors TV. Archived from the original on 25 November 2011. Retrieved 16 November 2011. ^ "Coates Hire Leaderboard". Supercars. 4 December 2016. This page was last edited on 15 April 2019, at 01:52 (UTC).